I would bet that the problem is up in that box under your fan. You must have loosened a connection while you were installing the fan. The vacuum cleaner causes a big load when the motor kicks on. Thia demand can make loose connections fail. I would start and look at the junction box that was disturbed. I'm sorry to say that box is where you installed that ceiling fan. Yo u have to also remember that ceiling Fans vibrate. 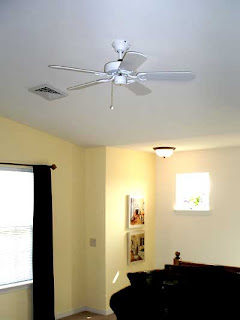 If your connections are not done right the vibration of the ceiling fan will cause them to come loose. I had that problem last year in a house in Philadelphia. I think it was in the Chestnut Hill or Mount airy section. A client of mine install his own ceiling fans and then two weeks later he had power problems. He swore that the ceiling boxes were fine because he only looked at them a few weeks ago. Problem often occur at the last disturbed place. That is where his problem was too.